We’d love your help. 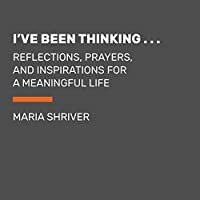 Let us know what’s wrong with this preview of I've Been Thinking . . .Reflections, Prayers, and Meditations for a Meaningful Life by Maria Shriver. To ask other readers questions about I've Been Thinking . . .Reflections, Prayers, and Meditations for a Meaningful Life, please sign up. If I say I didn’t enjoy listening to this audiobook - was bored and critical - does that make me a negative person? I guess it’s the chance I’m willing to take. 94% of the reviews on Amazon are 5 stars. I’m not one of them. This was an Audiobook library freebie. I had no idea what I was getting into. Perhaps as a physical book - ‘without’ feeling knocked down and lectured to - I might have at least appreciated the quotes in the book. 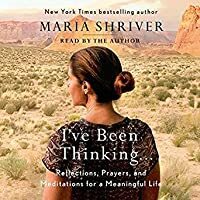 I understand it’s a book about Maria Shriver sharing what she’ If I say I didn’t enjoy listening to this audiobook - was bored and critical - does that make me a negative person? I guess it’s the chance I’m willing to take. I understand it’s a book about Maria Shriver sharing what she’s learned about life -about living a life of gratitude. She quotes many philosophers - poets and other spiritual leaders. She shares with us her own personal prayers. The intention for this book is to be helpful and empower others to live the best life possible - be positive- think positive - and make a positive impact in the world. Maria didn’t use the word ‘crappy’ either. —- but I can’t honestly say I enjoyed the delivery of all these wonderful words of inspiration. but Maria Shriver....as sincere as she is.....makes for DULL LISTENING. Maria’s heart on every page. Hopeful and optimistic without a Pollyanna attitude. Maria sees the world as it is, aspires to do better and challenges us to be our better selves. I’ve long been a fan of her journalistic integrity, something that is sadly missing these days, and her commitment to finding a cure for Alzheimer’s. Her mother, Eunice Kennedy Shriver, was one of the most admirable women of the 20th century and Maria has taken up the mantle beautifully. As a daily devotional or as a frie Maria’s heart on every page. I’m always looking for books on meditation, hoping I can cement my practice and keep it fresh because I fall out of doing it usually when I need it most. This book is a treasure! It’s full of quotes from Emerson to Buddha, Maya Angelou to Carl Jung. Maria Shriver shares what she prays for every morning. Everything is present-focused, positive, and self-accepting. While there is most definitely a Christian focus, there are many quotes and meditations offered that are secular. There was a quote Maria found inscribed in a book given to her by her mother. I still have tears when I think about it. This is a book I’ll refer back to, read a section here and another section there, as reminders. It’s both comforting and uplifting. A beautiful and inspiring book to help ignite reflection and clarity. I’VE BEEN THINKING is a book of reflections and meditations on how to live a life full of meaning. It is written by MARIA SHRIVER who grew up in a family where people did meaningful things, like run for President, or started programs that changed peoples lives. As a prominent woman that juggles many roles, Shriver knows just how hectic and stressful everyday life can be. In this heartfelt book, Shriver offers up the less A beautiful and inspiring book to help ignite reflection and clarity. I’VE BEEN THINKING is a book of reflections and meditations on how to live a life full of meaning. It is written by MARIA SHRIVER who grew up in a family where people did meaningful things, like run for President, or started programs that changed peoples lives. As a prominent woman that juggles many roles, Shriver knows just how hectic and stressful everyday life can be. In this heartfelt book, Shriver offers up the lessons she learned along the way of what’s important. This book is indeed a rare gem. It’s a book that must be consumed very slowly and then reread frequently. It would make a great gift book for any woman struggling with the twists and turns on the rollercoaster of life. I received this delightful book as a gift from my dear friend, Dale, and I will certainly be passing it on to others. We all struggle with who we are, or what we think and how we can make a difference. This book offers over sixty different reflections, quotes and prayers to help stimulate your own thought process. Some of my favorites were reflections titled Chasing the Illusion of Perfection, I’m Giving Up Complaining, and Why We Should Stop Trying to “Go It Alone.” Shriver’s writing is thoughtful, honest and highly relatable. It’s full of her own heartfelt personal stories and she soulfully explores each reflection with a fresh and modern perspective. This is one of my favorite books of 2018. MARIA SHRIVER is the mother of four, a Peabody Award winning and Emmy Award winning journalist and producer. She is the author of six bestselling books, a NBC News Special Anchor, and the founder of the Women Alzheimer’s Movement. This book evolved from her I’ve Been Thinking column in her digital newsletter, The Sunday Paper. I received this book in a Goodreads giveaway. Thank you! This book is a series of short essays on varied topics pertaining to living a good life filled with love, kindness and purpose, followed by a short prayer. Part of me wonders how it would come across to a nonbeliever or a reader whose beliefs are not Catholic Christian. But, generally these are heart-felt thoughts, honestly expressed. The essays are short and thought-provoking, easy to read in short spurts. The book is a good way to take a f I received this book in a Goodreads giveaway. Thank you! Maria is one of those go to authors for inspiration, insight and clear minded thinking. She writes with complete honesty and from her soul. This book is one I will read over and over again when I am looking for reminders for how to stay on the path of moving forward with courage, love and positivity. Beautiful, calming, inspiring. I have never met this woman but feel I know her as a friend through her writings. Maria Shriver is totally correct in saying we are now living in times where more is needed. Men, women and children across this nation and world are tired of the prevailing negativity, yearning for that which makes life “good.” No, this is not a self-help book for Pollyanna-type persons but one in which one finds inner peace, purpose, love, and even joy. Before each meditation in this book are quotations from notable people, those who’ve made a difference in the world but not been satisfied by ex Maria Shriver is totally correct in saying we are now living in times where more is needed. Men, women and children across this nation and world are tired of the prevailing negativity, yearning for that which makes life “good.” No, this is not a self-help book for Pollyanna-type persons but one in which one finds inner peace, purpose, love, and even joy. Before each meditation in this book are quotations from notable people, those who’ve made a difference in the world but not been satisfied by external accolades. Instead they’re centered on the inner world that fuels their thoughts, words and deeds. For example, “Who you become as a person is up to you – up to your imagination, your will, your determination, your choices…” or “What you think you become” shared by the Buddha. Then there are sections that we have heard before like pieces on love, honesty, forgiveness, and so on. But what about the power within each of us for “empathy,” “losing faith,” “not caring too much for what others think,” living in a “complaint-free zone” periodically, “a culture of care,” “the process of discernment,” “grieving,” and so many more topics will catch your attention and invite you to ponder each one. One is to consider meditating on it with prayer or just letting it be in one’s consciousness until one is ready to move on to the next one. This is not a book to be read cover to cover quickly; it’s full of wisdom and points of view that are right at different moments in life. It has thoughts and advice that one will want to repeat reading and contemplating as well as passages that will provoke and inspire at different times. There’s no one result or goal. The process is to just “be” with each section or passage. Maria Shriver comes from a family of doers but this is a book about the fire and fuel behind the doing and being! Highly recommended, inspirational nonfiction. It could just be the best book you read right now! Quick read, thought-provoking, compelling, captivating, relatable, spiritually inviting, and applicable are words that easily come to mind while reading this book. This is one of the best books I've read in a while. It is insightful, kind, generous, meditative, reflective - basically everything the title promises. It did not disappoint. I downloaded this from the library, but want to read it again (and again) and plan on purchasing it soon. I recommend the audio book - read by Maria Shriver. It was perfect. I believe I'll purchase a hard-cover version, however, such that I can refer to certain sections easily. I give 5-star ratings to books I purchase. I lo This is one of the best books I've read in a while. It is insightful, kind, generous, meditative, reflective - basically everything the title promises. It did not disappoint. I downloaded this from the library, but want to read it again (and again) and plan on purchasing it soon. I recommend the audio book - read by Maria Shriver. It was perfect. I believe I'll purchase a hard-cover version, however, such that I can refer to certain sections easily. I give 5-star ratings to books I purchase. I loved every aspect of her catalog: how she broke it into magnificent, thought-provoking sections and supported each with her introspections. Her brilliant references to philosophers were wonderful. Each reference could be another book selection, or two. As someone who isn't religious in an organized religion sense, I still feel spiritual and her prayers after each reflection were simple and true. This book just implores me to be a better person. It makes me want to sit down with her to have coffee and discussions. I admire her strength and courage. I would highly recommend this book. It's a series of "reflections, prayers, and meditations on a meaningful life" that Maria has written that seem to be directed toward the challenges with which I'm facing at this stage of my life. It's also an easy read as each section is just a few pages, so you can dip in and out of it at any time. Wish I'd bought this one instead of borrowing it from the library as I would have enjoyed having it as part of my personal library. This was such an awesome awe inspiring & inspirational book which will find a place with my bible! I had to highlight & tab so many pages to refer back to at times when I meditate and pray. I quickly read the book which gives short essays on different aspects of everyday life and the different journeys we all face at some time. Now that it is read I am going back chapter by chapter and apply it to my life. Reading it causes reflections of my own life and the prayers are heartfelt. It seems like a perfect book to pick up for the new year. Disappointingly repetitious, full of platitudes, and poorly edited. Excellent book! Planning on reading it again in the new year. 4.5 stars. "I've Been Thinking" is a glimpse into how Maria Shriver is able to make the most out of life. This book is the literary equivalent to having a huge cup of tea with a really good friend. It is thoroughly comfortable and satisfying. I think it's always important to keep in mind that books like this about people's ways of finding themselves in the world may not work for everyone. Shriver is up front with this in this book: her way may not be the right way for everyone but it works for he 4.5 stars. 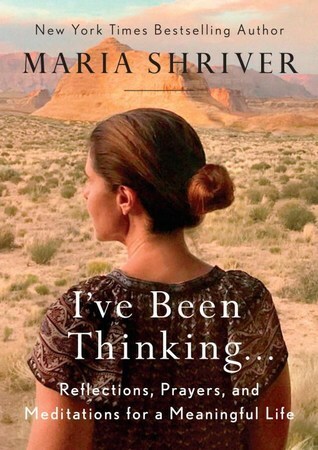 "I've Been Thinking" is a glimpse into how Maria Shriver is able to make the most out of life. This book is the literary equivalent to having a huge cup of tea with a really good friend. It is thoroughly comfortable and satisfying. I think it's always important to keep in mind that books like this about people's ways of finding themselves in the world may not work for everyone. Shriver is up front with this in this book: her way may not be the right way for everyone but it works for her. I saw that a lot of her methods and the things that she thinks about could be molded to my own life. One of the things that stuck out most to me were her ruminations about mothers. She had an incredibly strong mother and Shriver herself seems to be a pretty strong mother. She mothers sometimes in a different way and sometimes in the same way as her mother. Mothering has been my most difficult job and it seems to carry such a huge responsibility. One day, these little people that I am raising are going to be out in the world. How do I set them up for success? Shriver gives a little insight and a little grace to the conversation. This is really a collection of articles that Maria Shriver has published in her weekly (?) newspaper column. They cover all sorts of thoughts, from belief in God to politics, from family to personal growth. Although I believe this book was written from a place of caring and consideration, I kept thinking that Shriver is actually quite removed from the "regular folk." She grew up in a wealthy and famous family, and she moved into a public and political marriage. I appreciate the fact that she's n This is really a collection of articles that Maria Shriver has published in her weekly (?) newspaper column. They cover all sorts of thoughts, from belief in God to politics, from family to personal growth. Although I believe this book was written from a place of caring and consideration, I kept thinking that Shriver is actually quite removed from the "regular folk." She grew up in a wealthy and famous family, and she moved into a public and political marriage. I appreciate the fact that she's non-judgmental and thinks a lot about her life and her beliefs, but I still got the impression that she's more focused on things that are totally different from my life. She's lived in a political world, of course, and sees things through that lens. And she's active and has a very public voice. All good things, or at least not bad things, but just not "regular." I'm sorry to place her in a category like that, but I'm trying to explain why I felt much of her advice and her thoughts were so far away from my reality. She seems like a truly caring person and I appreciated many of the things she said (witness the fact that I wrote down many quotes from her book that meant something to me or that made me think). But most of her thoughts weren't relevant. Maybe that's the way of all self-help books, and I should just take the nuggets that I can from it and not worry about the rest. And that I'll do. But that's the reason I'm giving it a middle-of-the-road 3 stars--I only found a handful of bits that work for me. But I particularly liked the hopeful nature of her narration and will probably look for more from her in the future. "Be open to help, be willing to ask for it, be brave enough to be grateful for it, and be generous enough to give it." "Forgiveness is letting go of the need to feel like a victim." "You are the hero of your own story. Stop making other people responsible for every twist and turn in your life. You made the decisions that got you from Point A to Point B. You worked hard. You navigated your way to where you are today. Your story is a heroine's journey. Tell it that way." Such a beautiful, insightful book written by am incredible woman. I'm not religious but can appreciate all the prayers and all of her idea and outlook on life in general. Have hope. Thank you for allowing me my digital review copy to read! Could not come at a better time. So uplifting, and the chapters are short, but at the end of each one I have reflected on how this can make my life more positive and richer. There are 3 chapters that have had a profound effect, “The Power of the Mind”, women and Alzheimer’s have been brought to the forefront by Maria. I have been lucky enough to hear her speak at the Alzheimer’s Forum twice. Wow. “Power of Motherhood”, tears. I have gone Thank you for allowing me my digital review copy to read! Could not come at a better time. So uplifting, and the chapters are short, but at the end of each one I have reflected on how this can make my life more positive and richer. There are 3 chapters that have had a profound effect, “The Power of the Mind”, women and Alzheimer’s have been brought to the forefront by Maria. I have been lucky enough to hear her speak at the Alzheimer’s Forum twice. Wow. “Power of Motherhood”, tears. I have gone back a reread that chapter several times. So powerful and expresses what as mothers we all want to feel. But the message in a book her mother signed says it all for me. “Only in Heaven Will I Love You More”. I recommend this book to everyone. There wasn’t a chapter that didn’t touch on my life. This book will become my go to reference. And I will be sending a copy to both of my daughters. Lodged somewhat blandly, a few pearls of wisdom can be pried out with a highlighter. It doesn’t feel like there’s anything new here, Maria’s writing feels plain, but soothing to read nonetheless. That said, I don’t think the book was meant to be inhaled in two days like I did. Perhaps small daily doses is the key here. The title does include the words “Refections, Prayers, and Meditations”, so perhaps my hasty pace made the writing style seem a bit stale. There’s a couple great reminders for anyo Lodged somewhat blandly, a few pearls of wisdom can be pried out with a highlighter. It doesn’t feel like there’s anything new here, Maria’s writing feels plain, but soothing to read nonetheless. That said, I don’t think the book was meant to be inhaled in two days like I did. Perhaps small daily doses is the key here. The title does include the words “Refections, Prayers, and Meditations”, so perhaps my hasty pace made the writing style seem a bit stale. There’s a couple great reminders for anyone whose season of having kids at home is drawing to a close—wise council to enjoy the last bit of time left with them. Also a timely reminder to enjoy this new phase of life that becomes “more unscripted and wide open”. I was also inspired by her ability to take the time in specific and focused ways to be with family members, especially grown siblings. 5 Stars- I love Maria Shriver so it was easy for me to also love her book. There’s something for everyone in here. So much inspiration along with things to think about and actions to take. I bookmarked a lot and will definitely refer back to this one. A wonderful book that’s worth reading! One may think Maria Shriver lives a privileged existence. While she may have been born into wealth, she has devoted her life in service of others. She shares little stories and anecdotes picked up throughout her 60 years on this earth. There's plenty here that we should already know (such as: don't care what others think, dealing with grief happens on your own timeline) but it's a fresh reminder that even those who are well-off financially such as herself still have all the same normal insecurit One may think Maria Shriver lives a privileged existence. While she may have been born into wealth, she has devoted her life in service of others. There's plenty here that we should already know (such as: don't care what others think, dealing with grief happens on your own timeline) but it's a fresh reminder that even those who are well-off financially such as herself still have all the same normal insecurities and pain that everyone else does. Just because you have that privilege doesn't make life a cakewalk. I found her unwavering strength in hope and the universe to be inspiring. I can throw in the towel when things turn south and not look on the bright side. It can be difficult to keep your energy up when things seem so bad. Maria Owings Shriver is an American journalist, activist, author of six best-selling books, and former First Lady of California.